If you like note drawing apps for the iPad you should definitely consider Penultimate for iPad from Cocoa Box Design. The app gives you a very realistic looking notebook with 3 types of paper that you can draw on using your fingertips or a pogo stick with a smooth ink based pen tool. The strokes are drawn on paper backgrounds in what feels almost like real time response to going from your touch to appearing on the iPad screen. Drawing in Penultimate is something that can’t be quite explained in words. You just have to try it for yourself to see how flawlessly things work. Using your fingers you draw out shapes, text or graphics with black lines. Penultimate is a wonderful app to have around during your meetings, classes, or just for fun. The lines fade out if you quickly release your ending strokes for a lifelike effect. The overall feel of the the app is more like a whiteboard that a notebook. Drawing small text using your fingertips is very hard to do, unless you use a pogo stick. The eraser tool has a nice large radius that’s very handy for wiping errors quickly. Undo and redo also come in handy for fixing small mistakes. 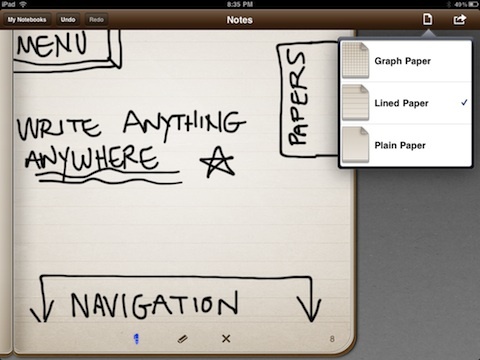 The app lets you organize your notes into Notebooks that can store many pages each. You can flip through your notebooks and assign a name to them for quick reference. Tap any to open it up and start writing. Navigate pages by tapping hot spots on the bottom of each page. Options in Penultimate include and eraser tool, paper types, notebook and multiple page support, export, undo and redo. You can pick your canvas to be graph paper, lined paper or plain paper. Share your drawings by emailing single pages or the entire notebook. When you share an entire notebook, Penultimate creates a PDF document with all of its pages which is greatly convenient. – Having the ability to set coverpages for your notebooks, perhaps with writings, images or typed text that would make it easier to distinguish them in the My Notebooks view. – The ability to use different color inks, maybe red and blue to customize documents. Overall, Penultimate is a superior ink drawing app for the iPad that can serve as a productivity utility for jotting down notes the way the iPad is meant to be used. The app has sharp graphics and a beautiful design coupled with a smoothly implemented ink based pen tool that your fingers will quickly fall in love with. AppSafari review of Penultimate was written by Joe Seifi on May 3rd, 2010 and categorized under App Store, Art, iPad apps, Notes, Productivity, Utilities. Page viewed 7253 times, 1 so far today. Need help on using these apps? Please read the Help Page. Great app. Would be even better if they were able to incorporate OCR. I use this app while I’m studying for grad school and to have the ability to email questions, in my own handwriting, to my professors is a very helpful aspect of this app. If this also had the ability to record audio notes as well this would even be better.